Dr. Blake Gilks is a Professor in the Dept of Pathology and Laboratory Medicine, at the University of British Columbia, in Vancouver Canada, and does clinical service work in the Division of Anatomic Pathology at Vancouver General Hospital, the site of the largest gynecological oncology program in the province of British Columbia. Dr. Gilks leads a research program focused on gynecological cancers and is co-founder of the Genetic Pathology Evaluation Centre, a laboratory that uses tissue microarrays of human tumor samples for cancer research, and OvCaRe, a multidisciplinary team studying ovarian cancer. 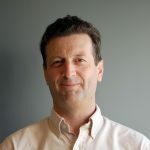 He is also co-founder and co-director of the Canadian Immunohistochemistry Quality Control program, which provides proficiency testing for Canadian diagnostic immunohistochemistry laboratories.